This is the second in a series of blog posts in which I will briefly introduce many of the exciting new features that will appear in GoldSim 12 (which we plan to release in February 2017). The previous blog post discussed several of the key features of the updated graphics and user interface for GoldSim 12. Today's blog post focuses in detail on one of the features we briefly discussed in the last post: the updated behavior of input and output ports. This feature is important because it will have a significant positive impact on the appearance of your models. As can be seen, hiding the ports is a great improvement. As all experienced GoldSim users know, however, the ports are actually quite important, so it is critical that they are accessible (in fact, as you will note above, not all of the ports are hidden). 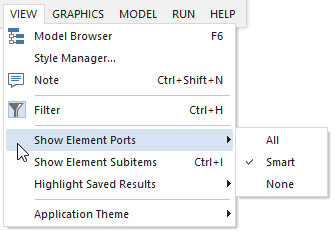 In GoldSim 12, holding your cursor over an element will always cause the ports to be displayed. But as discussed below, they are also displayed automatically under other circumstances. To understand the new port behavior, it is useful to review why ports are important in the first place. Ports serve two important purposes. There are several reasons to do this, with the most common one being viewing the list of outputs in order to display results for a particular outputs. Pond1 has an input that comes from another Container. has an output that is used in another Container. Smart. This is the default. If this is selected, ports are only shown if they have some status information to display (e.g., results, links to other Containers). In the examples shown above, this is why only one of the two ports are shown in some cases. All. The ports are always shown. None. None of the ports are shown. In the overwhelming majority of cases, the default (Smart) is the appropriate option. Occasionally, you may want the hide all ports (None) so as to make the graphics pane look even less complicated. It is rare that you would want to show All. We will continue to explore the many new features of GoldSim 12 in subsequent blog posts.